This week’s Cyclist of the Week is DK Girl, Elizabeth Hablinski! Here’s what she has to say about doing 100 DK miles. 1. Why did you sign up for The DK 100? In 2015 I was a brand new baby cyclist when a friend asked me to run their DK support for them that year. 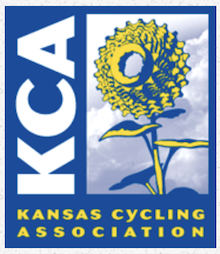 I had never heard of Dirty Kanza but was fascinated and said yes. Upon arriving in Emporia I was enamored with the whole thing- the people, the town, the gravel culture… and mostly the glory of accomplishing such an incredible feat. I swore I’d do it one day. This year I chose the half pint as a way to dip my toe in the water so to speak. I plan on tackling the 200 next year for sure! 2. What kept you going during the 100 miles? My Mom and stepdad were running support for me. Knowing they were there at the finish line waiting for me kept me pushing hard. Giving up or slowing down was not an option unless my body or my bike broke. When I would start to feel discouraged I just imagined myself crossing the finish line. 3. What was the biggest challenge you faced? I started the race really strong and at the 50 mile checkpoint I’m pretty sure I was in 3rd place (women). At mile 85 when women I’d blown by in the first half started passing me up, I started to come down on myself. I really wanted to finish in the top 10. The fact is, they were riding smart- in a pace line and at a quick but sustainable pace. Whereas I had gone out too fast in the first half and rode the 2nd mostly alone. Fighting off the “should have/could haves” was probably my biggest challenge. 4. What did you take away from the DK experience? I entered DK to learn about endurance racing, but also to learn more about myself – how would I respond to the inevitable challenges that would be thrown at me in the Flint Hills. I ended up coming in 1th place (women) which I am pretty proud of. I didn’t make my top 10 but I came pretty darn close! But the biggest take away has less to do with cycling and more to do with life in general. My parents were beyond thrilled to be involved in supporting me at DK. I think my finishing meant just as much (if not more) to them as it did to me. It was a reminder that challenging experiences are the most glorious when shared with the ones you love.